• Widely used in daily rite and ceremonious events such as wedding, banquet, party, meeting or other occasions. • Made from polyester, which make the covers wrinkle resist, durable but also very elegant. • The edges of the covers are perfectly processed into smooth appearance. • Each is individually packaged in a re-sealable, clear storage bag, and can be used dozens of times. • Easy to install and care. 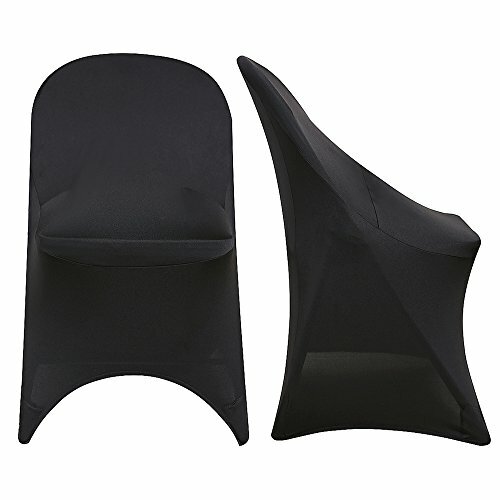 Spandex polyester chair cover for wedding, banquet, party, meeting, etc. You can wash Chair Covers by hand, machine, or dry cleaning with mild detergent. No need ironing. Strong 200gs/m fabric weight. Each Chair Cover individually wrapped. If you have any questions about this product by Surmente, contact us by completing and submitting the form below. If you are looking for a specif part number, please include it with your message. SPRINGROSE 50 Fuschia-Hot Pink Wedding Satin Chair Sashes. These Are a Wonderful Decoration for Your Chairs. Be Sure and Add Them to Your List of Party Supplies.